From USA Today Bestselling Author L.T. Ryan – Available for a limited time at an amazing price – two fast-paced Jack Noble thrillers! NOBLE BEGINNINGS (JACK NOBLE #1) – Over 300 5-Star Reviews! This Jack Noble political thriller is not for the faint of heart! A DEADLY DISTANCE (JACK NOBLE #2) – Over 180 5-Star Reviews! This package of two books was offered free on the Amazon App store. 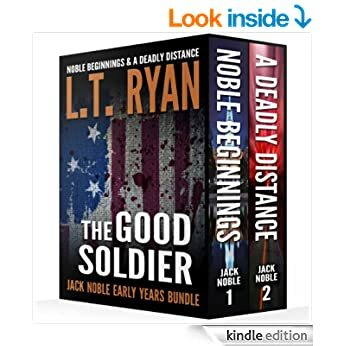 My first impressions upon finishing these first two books in the Good Soldier series is two-fold: One, the author, L.T. Ryan, knows how to write; Two, they are filled with what I call “OTTT”, which is, Over The Top Testosterone. I’m sure out in the world, there are men like Jack and Rile (Bear), both over six feet tall and hundreds of pounds of “pure muscle” that take on crowds of criminals with uzis, knives and bombs and emerge without as much as a scratch to show for their effort. They casually wipe their dirty brows, grunt a sound of accomplishment and swagger off to the next saviour enterprise. While reading such exploits of super-human He-Men, they in no way reflect actual reality as is known in the real world. The non-stop action where no one is tired after fleeing one unrealistic expectation after another is enjoyable to read, I wish Ryan would have added some measure of reality-such as even stating how tired tired they are, how they want a shower or why they seemingly have unlimited resources available whenever they want or need. The prison scenes are escapist fantasy for readers. Who wouldn’t like beating more powerful cellmates or getting one over on the guards, but hey, this is Jack and Bear! Beating up men twice their 6′ 250 pound sizes (approx) and having moles everywhere to help at the drop of a hat. Don’t get me wrong, the books were both a good read to escape reality, read about super-he-men doing fast and furious feats beating the bad guys. Ryan knows how to draw the reader in, there weren’t any slow scenes, he kept the descriptive landscapes to what was only required (what some writers have an overflow of exposition that you glaze over). This is more action-adventure than mystery or thriller, to be sure, but still enjoyable. I would give 3 1/2 stars.